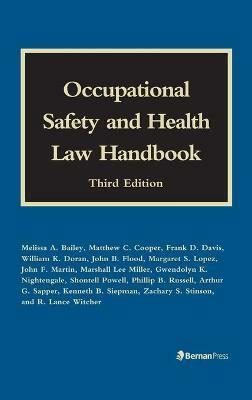 Now in its third edition, this popular Handbook has been your go-to guide to the fundamentals of occupational safety and health law for over a decade. This new edition provides an authoritative and up-to-date reference that you count on for its reliable information and straightforward explanation. Each chapter is written by a highly respected attorney who is an expert in the field. Yet the book is written without legal jargon, in plain English that anyone can understand. In it, the authors provide interpretations of many facets of the Occupational Safety and Health Act, review regulations and standards governing employee protection, and offer advice for dealing with regulatory authorities. The Handbook covers all of the important legal aspects of the Occupational Safety and Health Act with clearly written explanations of such issues as the boundaries of OSHA regulations, general administrative law concepts, and OSHA's enforcement tactics. It provides "Practitioner's Tips"-useful legal guidance given by experienced attorneys for complying with OSHA inspection regulations and enforcing employers' and employees' rights during inspections. It describes changes to the probable cause test under OSHA's "Warrant Requirement." It also explains the legal and practical consequences facing a business not contesting OSHA citations, OSHA's use of "Monitoring Devices on Employees," and more. This new edition covers major changes to the Hazard Communication Standard, new enforcement initiatives, updated regulations in the construction industry, new emergency response procedures, and more.